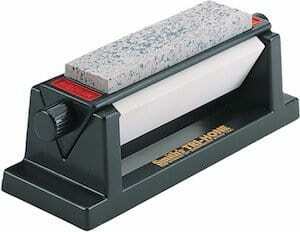 Smith’s TRI-6 Arkansas TRI-HONE Sharpening Stone System, is the companies foray into Arkansas stone sharpening. For those not in the know, Arkansas stone is a superior form of sharpening stone that are quarried from geological formations of Novaculite. The name comes from the fact that the only known deposits of Novaculite come from the Ouachita Mountains, in Arkansas. Novaculite is composed of microcrystalline quartz. The unique crystalline structure of the quartz gives Arkansas stones their superior honing abilities. Well that’s the short geology lesson over with, what about the knife sharpener? The Smith’s TRI-6 system features 2 types of Arkansas stone; a medium stone for sharpening (600 grit), a fine stone for honing (100 – 1200 grit) and a third coarse synthetic stone for more aggressive maintenance, (400 grit). To complete the functional design the tool is held upon a sturdy molded plastic base, that is weighted well enough to hold position on the work counter. Non skid rubber feet fasten the sharpener when in use. Being a whetstone knife sharpener the Smith’s TRI-6 Arkansas TRI-HONE does require lubrication to avoid friction burs when sharpening. The system does come complete with Smith’s premium honing solution, and is easily available should you run out. Albeit oil lubricated, the tool is still very easy to clean, with a “V” trough built into the system to collect the oil drippings. A simple wipe with the rag after use will help keep the sharpener in tip-top condition. Those used to whetstone sharpening will have no problems operating the Smith’s TRI-6 Arkansas TRI-HONE sharpener. The system comes complete with sharpening angle guide too. Non-skid base with “V” trough for oil drips.